The all new BLB King hubs add another level to our already strong range of high quality affordable fixed gear hubs. These low flange beauties have CNC’d aluminium shells and lock nuts as well as long life Japanese bearings. Based on BMX designs the BLB King Hubs are strong as an ox, but no where near as heavy. Mean enough for freestyle use and elegant and light enough for fast bike rides in the country; there’s little the King hub won’t do. 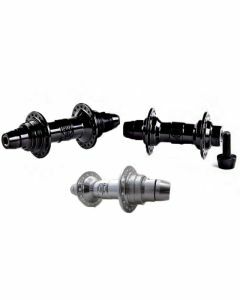 The king hub gives you the super tough and desirable female bolt system at a never before seen price.